What? No Sweetheart Candy For Valentine’s Day? I don’t mean to break your heart, but the famous Valentine’s Sweetheart candy, or conversation hearts, are in short supply this year. 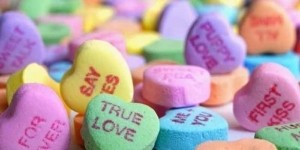 Valentine’s is not the same without the candy hearts with such fun sayings as “Be Mine,” “QT Pie” or “Kiss Me.” The candy company Necco that made the candy hearts, shut down and sold their plant last year. That means any candy hearts you find this year, were actually produced last year. Spangler Candy Company purchased Sweethearts and Necco Wafers in 2018 and plans to relaunch Sweethearts in time for the 2020 Valentine’s season. Necco, or New England Confectionery Co., was the country’s oldest continuously operating candy company, founded in 1847. Sure, this girl prefers chocolate (any day of the year), but candy hearts and Valentine’s go hand-in-hand.